Tip: Before an extended hike, do a shakedown with all your equipment. Before leaving on an extended hike, do yourself a favor–take a multi-night shakedown hike with all your equipment. Unless you hike overnight several times a year, don’t try to wing it. And if you have new equipment, give it a test run. Set up your tent under trail conditions and sleep in it. The best way to make sure that you will sleep comfortably, is to test your pad and bag, and your sleep wear, on an overnight. Fire up that stove, whether it’s old or new. If you bought a new GPS unit, now is the time to learn how to use it. During shakedown, you can organize your pack and gear the way you want it, so you’ll be ready to roll when you go on that long hike. You will be able to act quickly when the weather turns. You will be surprised at what you learn on a shakedown hike. Why doesn’t this food taste right? Should I bring seasoning? Is this water filter going to work, or do I want another option? How could I forget my packets of hot-chocolate? Yikes–I didn’t bring band-aids! I can never find my head lamp. I’m always losing my map. You get the idea; it’s better to get the kinks worked out ahead of time. Or would you rather look confused and befuddled in front of your kids, the guys, your significant other? Hats off to all Trail Angels and to any other good souls who make Trail Magic. As defined by Michele Ray in her book, How to Hike the A.T., a trail angel is a person who does kind things for hikers, such as offering them shelter, food, or water. Trail magic is comprised of the serendipitous, silent acts of kindness performed by trail angels. Trail Magic can be an exhilarating experience. Imagine yourself tired, cranky, and beat up from the trail. Most of all you are thirsty. You’re low on water and what water you have is warm. All of a sudden, you see a piece of cardboard fastened to a tree. ICE COLD DRINKS STRAIGHT AHEAD ON RIGHT! it says. Really? Can this be true? 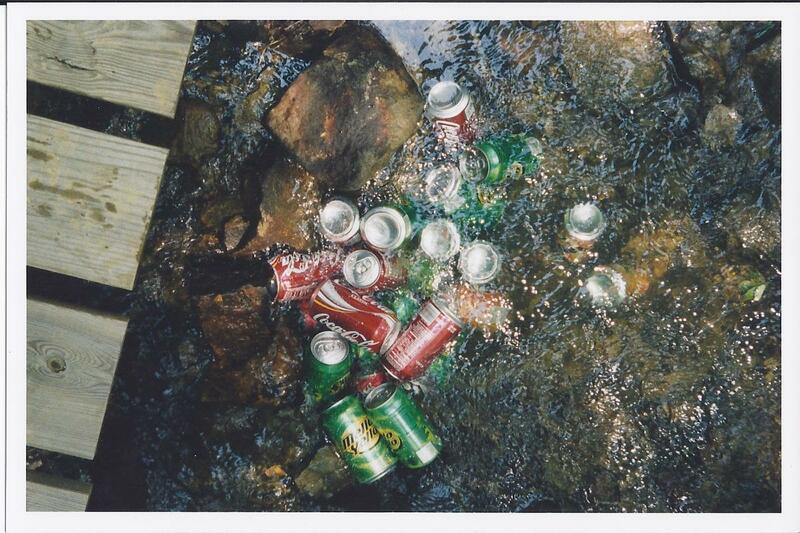 Sure enough, there’s a cooler stashed beneath a pine just off the trail. You swing up the lid and packed in ice are Mountain Dews, Cokes, Gatorades—bottled ice water! Yes, there are such grand and considerate people in our land. 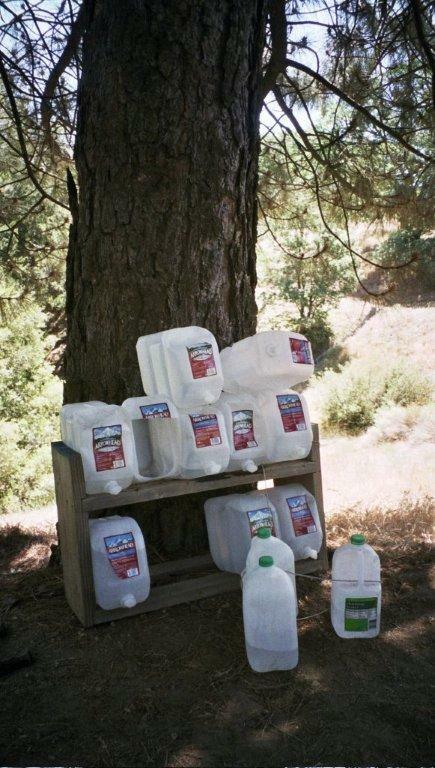 On the Pacific Crest Trail, trail angels regularly stock caches of bottled water in gallons along the desert boundary. These people are so dependable that their water caches are listed in the trail guides. They may be volunteers from hiking clubs, who take turns, but whoever you are, please know that we hikers appreciate it. At an Appalachian Trail junction near the town of Andover, Maine, an old man sat on a stump with a basket of fruit beside him. An apple never tasted so good. This trail angel told me he came to the same spot several times a week during thru-hiker season. He had peaches, pears, and plums, besides apples. Talk about trail angels. 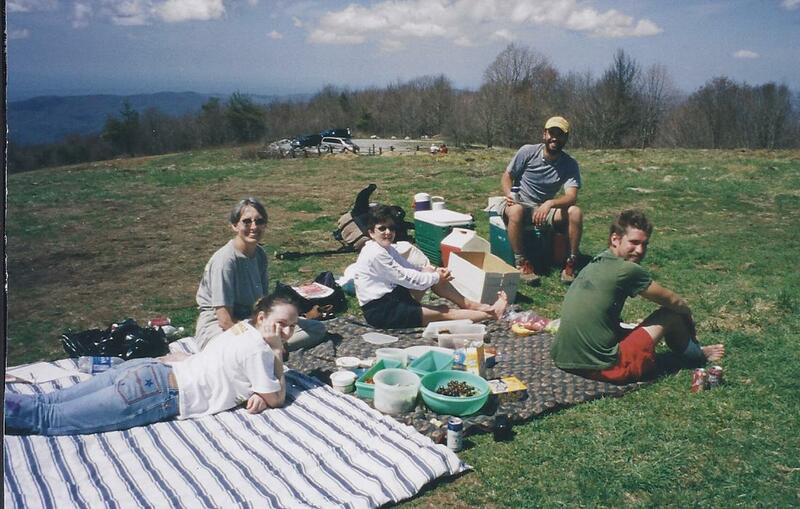 The picnic photo is from the top of Beauty Spot, a bald in North Carolina, right on the A.T. The three ladies on the left are trail angels. They drove a van, piled with food, to the top and shared with thru-hikers all day. The occasion? Easter Sunday, 2003! Need I say more. What trail angel or trail magic experience can you share? Mt. 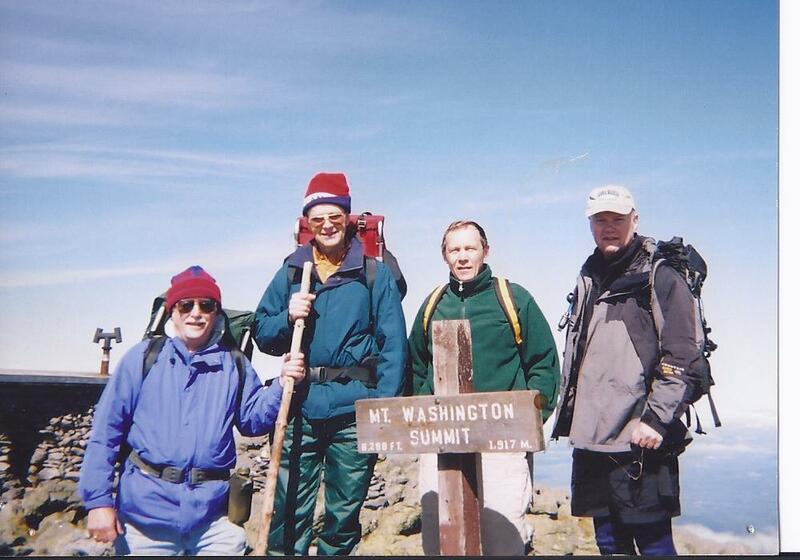 Washington: A grand but treacherous mountain. Mt. Washington, in New Hampshire, holds the record for the second highest wind speed ever recorded: 231 mph! The May 2011 issue of Backpacker magazine gives these statistics about the mountain for the continental U.S. Coldest year-round average temperature (27.2 degrees F), most subfreezing days per year (242), most days per year in heavy clouds (244), and highest annual rainfall (101.9 inches). The article goes on to say: Mt. Washington lies at a convergence of storm paths coming from the south Atlantic, the Gulf of Mexico, and the Pacific Northwest. Add the mountain’s north-south orientation (which blocks moderating west winds), and you get a recipe for perfect storms year-round. You must be prepared when you climb this grand but treacherous mountain. The picture was taken on a cold summit in August, but we had clear views which is rare. 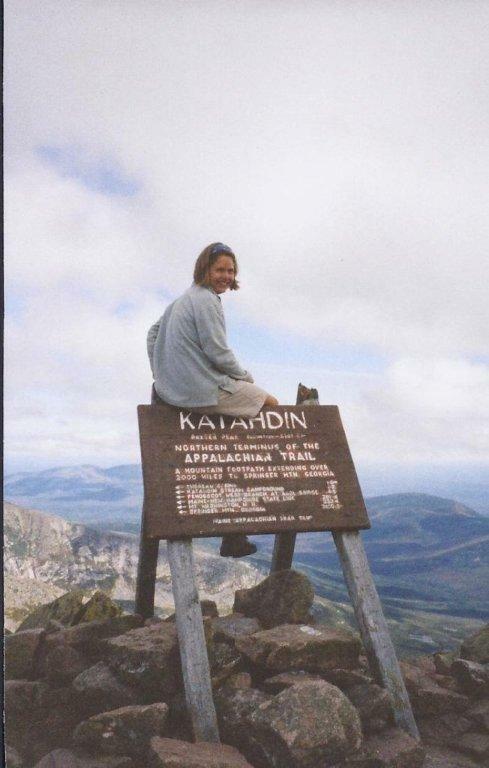 When I hiked over the summit on my A.T. thru-hike in ’03, I couldn’t see a thing as I squinted from cairn to cairn in a stinging rain. 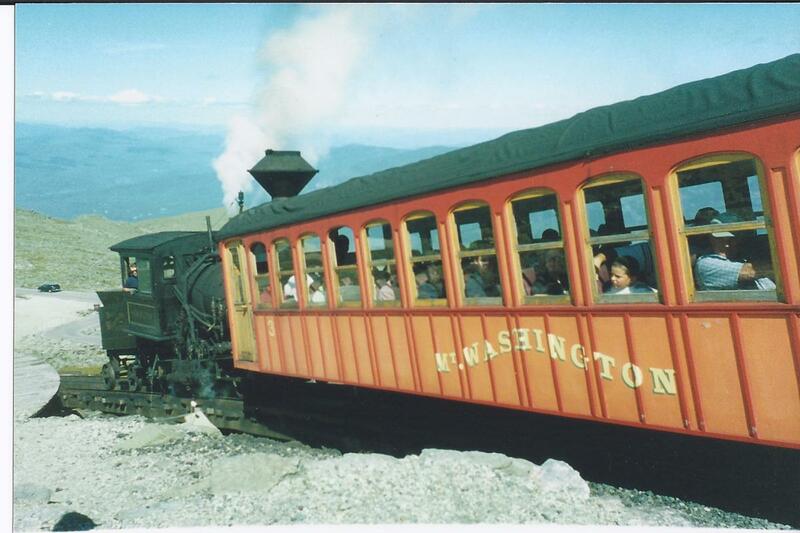 The four of us in the picture decided the hike up was enough and took the mountain’s Cog Railway down from the summit. HY-OH is a long-distance hiker’s mantra. It stands for Hike Your Own Hike, and here’s how it comes about. You meet some fellow thru-hikers on the trail and start hiking together every day. One day your fellow hikers want to go into town early. They see a yellow-blazed trail that cuts some time off the official white-blazed trail. You object, but they sell you on their idea. Mistake. Hike your own hike. Perhaps you want to learn more about flora in the region and wish to take more time examining wildflowers. The others are impatient and puzzled by this. So what! Hike your own hike. You pair off with the hiker you enjoy being with most. One day he says, “I’ve never been to NYC. Man, that’s one place I’ve gotta see. Can you show me around when we get near that area?” The last thing you have in mind is a congested metropolis. Be careful–hike your own hike. You’ve made a committment to yourself to complete this thru-hike. Your thru-hike. You like these guys you tramp with. One of them may become a close friend in the years ahead. But you are destined to fail in your quest, if you hike some other person’s hike and not your own. If you have a bit slower pace and struggle to keep up, you will hike yourself into injury. If you miss out on what you had planned to see or do, you will regret it later and may become disillusioned in the rough days ahead. HY-OH. Hike your own hike. 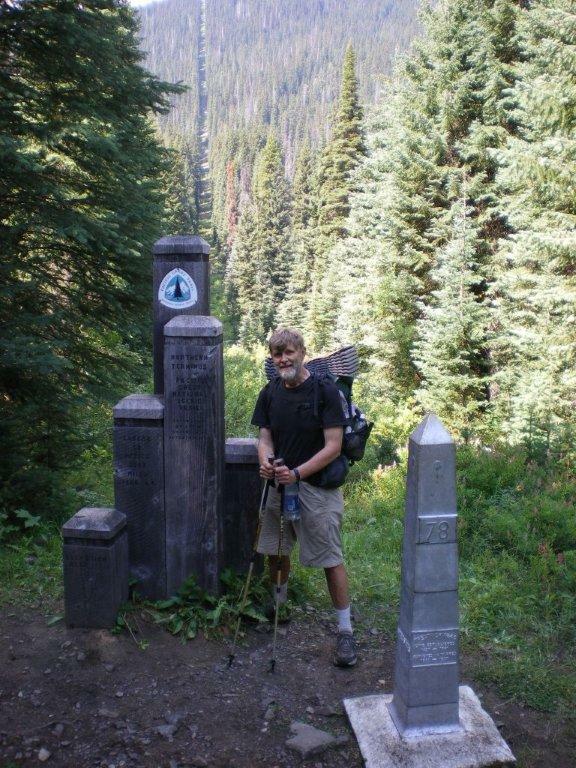 That’s the Canadian border terminus of the PCT in the picture.